Do you want to check the latest gadgets in the market? Do you want to get live scores of the soccer match while on the train? The world is going mobile, and everything is available at one’s fingertips. So, is there a possibility for learning being left behind? No, right. This means that learners look for learning to be just as accessible, using devices of different sizes. However, how do you ensure you develop a course that would suit your learners? What are the things to be kept in mind while developing a mobile learning strategy? With mobile devices, access to training and performance support material can be provided at the moment of need. Driven by enhanced software, hardware, and the budding habits of mobile phone users, the prospects for mobile learning have increased significantly over the years. Advanced web browsers and the incessant proliferation of smartphones have paved the way for commendable mobile learning strategies. In this blog, I am going to discuss some of the factors to consider before implementing mobile learning. I will also talk about why we should consider eLearning on tablets and mobiles and its usage in the corporate world. A client approached us to convert their existing eLearning content into mobile learning modules. Their major issue was that they had functional issues as well as SCORM features that were not getting tracked by their LMS. Our goal was to develop a learning experience that would be optimized for smartphones. We came up with the solution to convert existing Flash courses using Lectora 17, to make them HTML5 responsive and responsive to multiple devices, such as smartphones, tabs, and iPads. We developed simple intuitive courses that resulted in creating a high impact mobile-first design in learning. There are two ways to decide on the device to be used. Organizations can either provide the devices, or encourage employees to bring their own devices (BYOD). With the BYOD policy, learners can have access to their organization’s resources using their personal devices at the workplace.Many organizations are adopting this policy, as it is more cost-effective. Organizations looking to implement mobile learning see it expensive to provide devices to employees. This encourages them to adopt the BYOD policy as it is a cost-effective solution. Mobile learning courses are always bite-sized and available when and wherever needed. These courses are easily accessible on mobiles phones with proper Internet connection. The information provided to learners should be crisp and relevant. Ensure that the content provided is purely need-to-know. The bite-sized learning should address the context, but should not come with lots of content.For example, if a learner picks up a small module, he should find everything he wants to know in that. And if you really think you need to have the whole content included, then chunk the content into multiple screens and split the lot into modules. The user interface of the mobile learning course should be fully functional and easy to understand. Learners should be able to access courses on mobile browsers and the course design should be simple, neat, and attractive. The user interface design must be simple and consistent, allowing learners to quickly get used to it. The content and interactions should be designed for broader fingers. Buttons should be sized appropriately for selection with fingers. Refrain from using complex interactivities that hold the possibility of confusing learners. Use simple and neat interactivities that are engaging, with simple elements such as hotspots, rollovers, click on tabs, etc. You cannot push highly interactive content or Flash animations via mobile devices. Instead, those animations can be converted to videos and presented.As mobile learning is expected to offer just-in-time learning, you can always choose to have text with images (formats supported by the smartphones), keeping it simple, and avoiding too many interactivities. One of the most important considerations while developing a mLearning course is that it has to adapt to smaller screen sizes. Therefore, the need arises for the best rapid authoring tools through which incredible and appealing mLearning courses can be created. Four major tools are Adobe Captivate, Articulate Storyline, iSpring, and Lectora Inspire. These tools are great to develop efficient mobile learning courses. An LMS must be compatible with all mobile devices. It should serve and track the learning data accessed from any device. Any course which is developed in HTML5 and published to SCORM/AICC works well on most learning management systems. With these LMSs, you can track the learning data accessed from any device. Hardware costs include purchasing mobile devices, associated infrastructure such as server and device connection. Development costs include salaries for employees specialized in content management, instructional design, graphic designers, and authoring tool experts. You also have to bear the license fee for authoring tools that help in the transition of your eLearning to mobile learning.Since organizations have already developed a great deal of courses in Flash, they can Leverage on existing content, by reengineering to make it compatible with small screens. This would reduce huge costs to organizations. 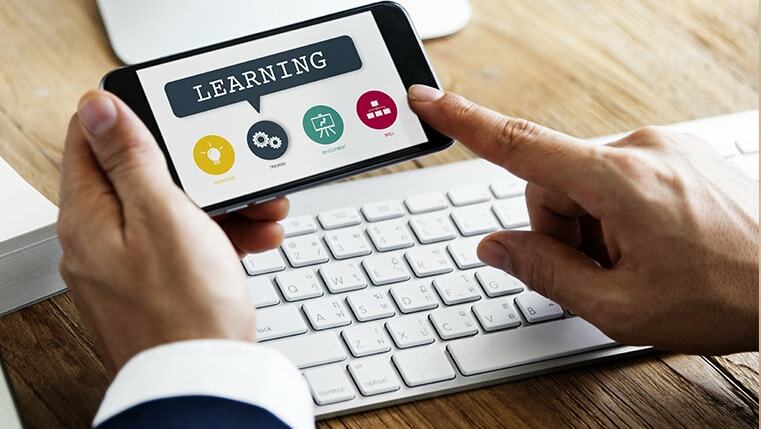 As tracking and reporting is an obligation for every training manager, linking your existing LMS to track mobile learning activities, has been seen as an important factor.With advances in technology, the future looks much more exciting for mobile learning with the possibilities of creating better learning experiences for learners. I hope this blog gave you an insight into how best you can use mobile learning in your training and consider ways to implement it in your organization.